Cozy and spacious living area with two sofas for ultimate comfort. 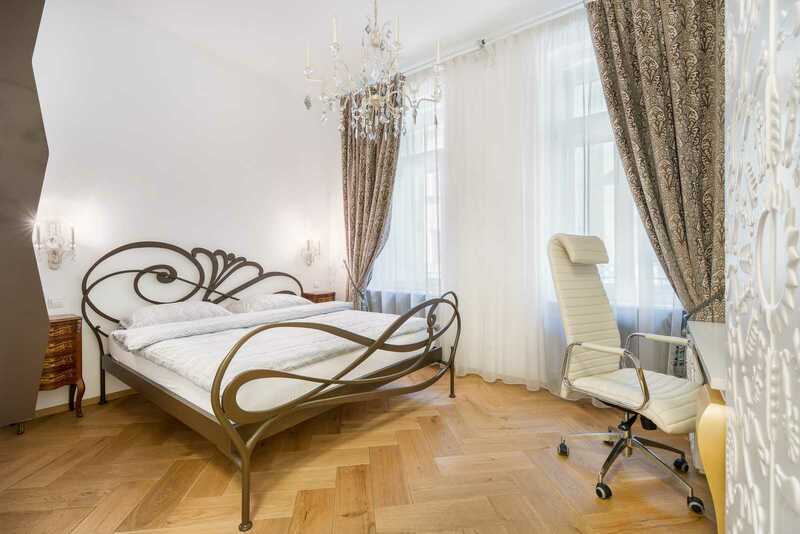 This fully modernized two bedroom accommodation is situated in the historic center of Ljubljana. 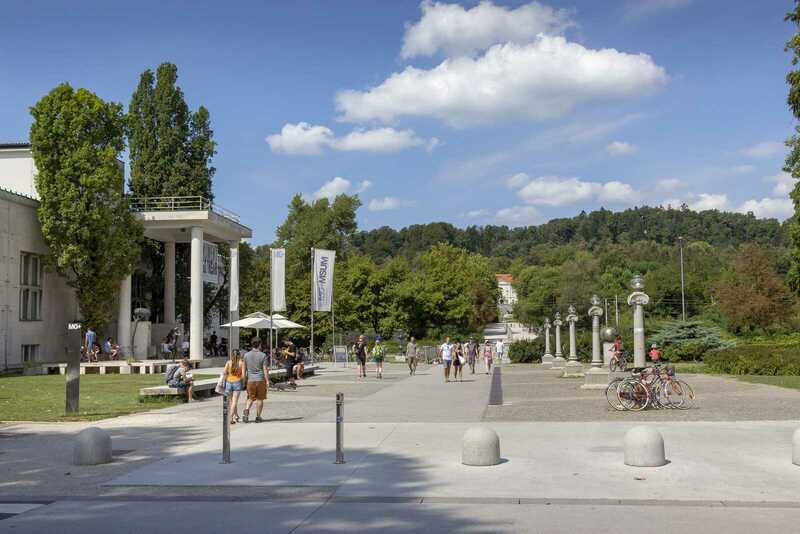 Close to many of the city’s main attractions and public transport links, it really is in the perfect location to make the most of your stay in Ljubljana. The innovative interior design has made the most of the accommodation’s classic features giving it a fresh, modern appeal. 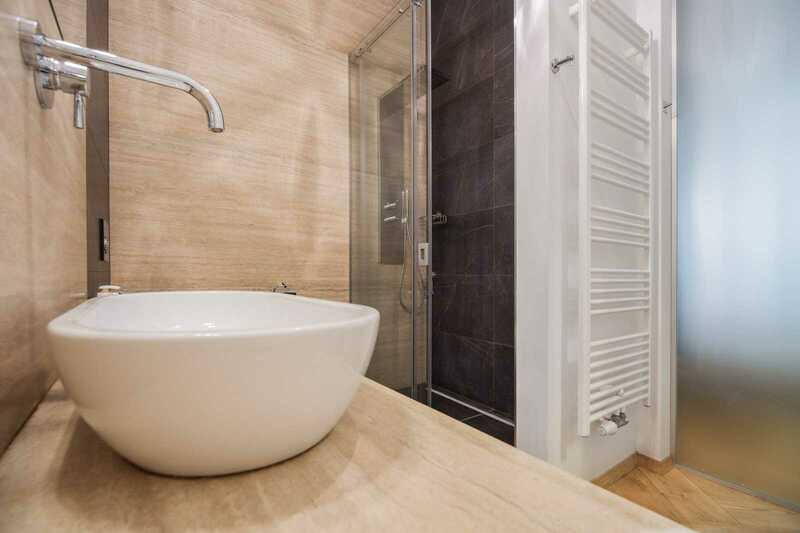 The apartment can sleep up to five, has a master bedroom with an en suite bathroom and a gallery sleeping arrangement in the second bedroom which is ideal for young people. The living area is particularly spacious, furnished in a contemporary style while the superb, fitted kitchen is ultramodern. Take a step outside and you’ll find the accommodation’s balconies are the perfect place to enjoy some of Ljubljana Old Town’s unique city buzz. 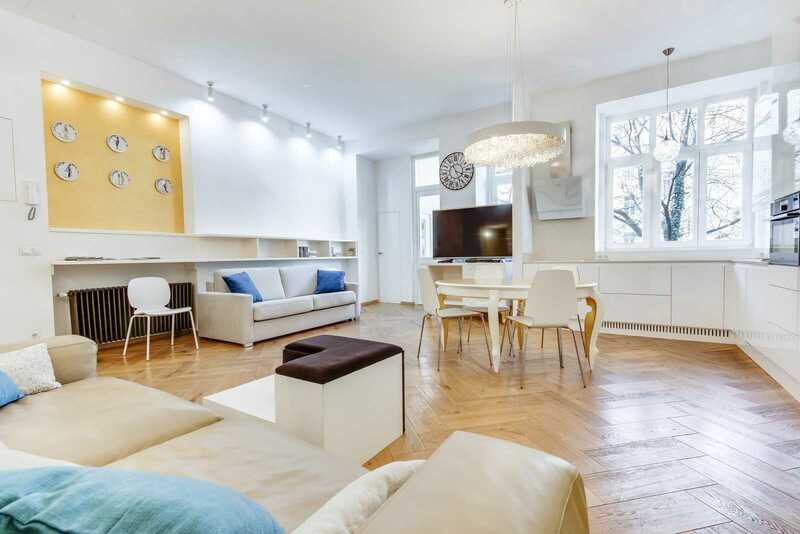 Walk into to the Ljubljana Old Town accommodation’s open-plan living area and its wide spaces are immediately appreciable. 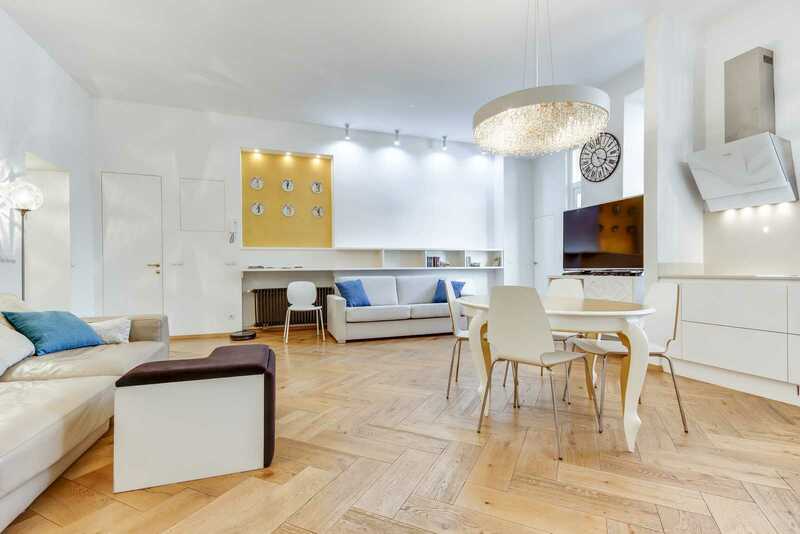 Polished parquet flooring accentuates the neutrally colored decor and abstract shelving. An extra large sofa provides comfortable seating to relax or view the flat-screen TV. In the entrance foyer there is a walk-in closet for coat, shoe and luggage storage. 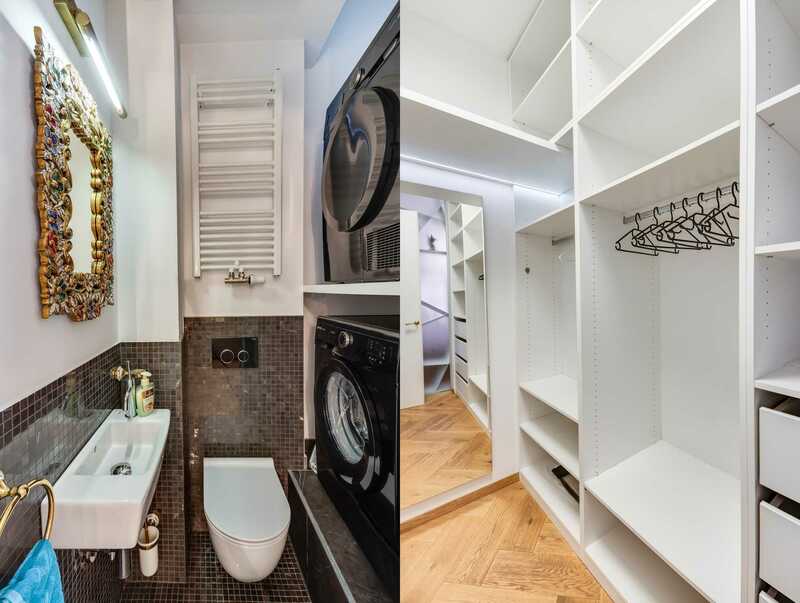 A separate WC provides extra convenience and also houses the washing machine and dryer. There is access from the living area onto the rear, south-facing balcony. If you’re interested in staying in Ljubljana Old Town, just get in touch! 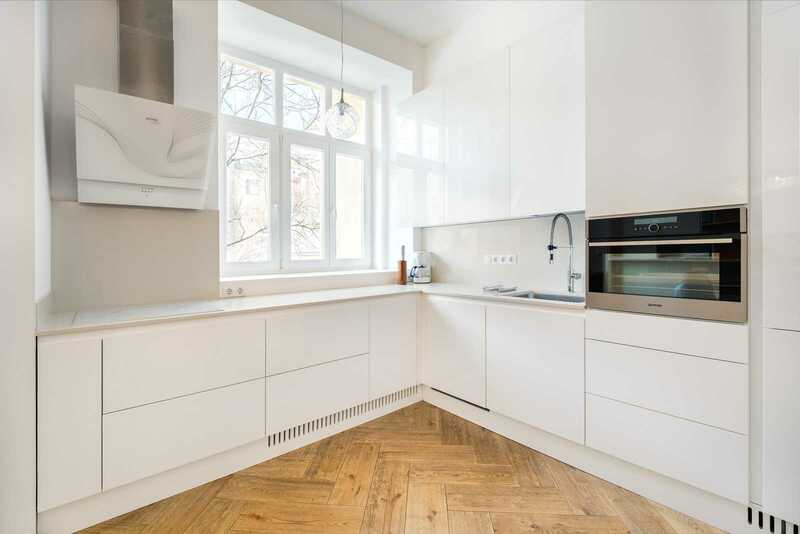 The kitchen in the Ljubljana accommodation is sleek and ultramodern. 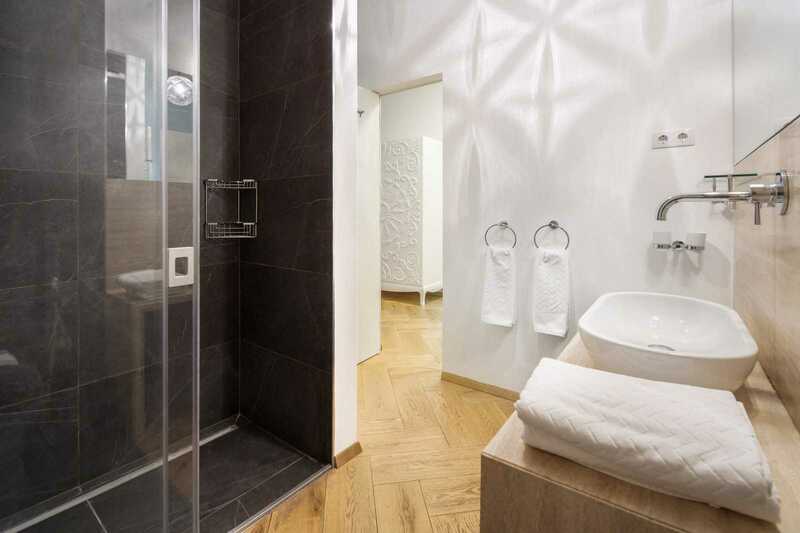 Plus it’s fully equipped with all the appliances you will need during your stay. Spacious fitted cupboards provide ample storage for groceries as does the top-of-the-range fridge-freezer. To make you feel right at home, there’s an American coffee machine as well as a ceramic hob, dishwasher, toaster and oven. The view from the kitchen window is of the rear balcony and the quiet residential square it looks on to. 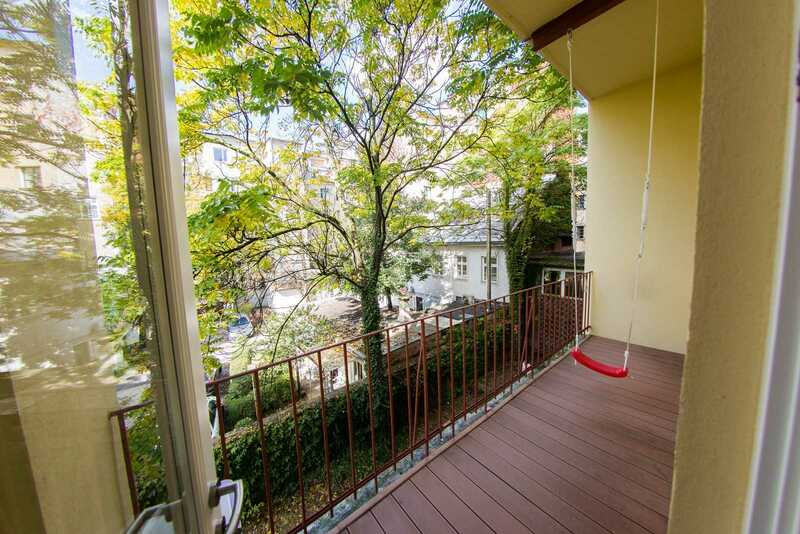 The balcony has a swing fitted which all the children will love. 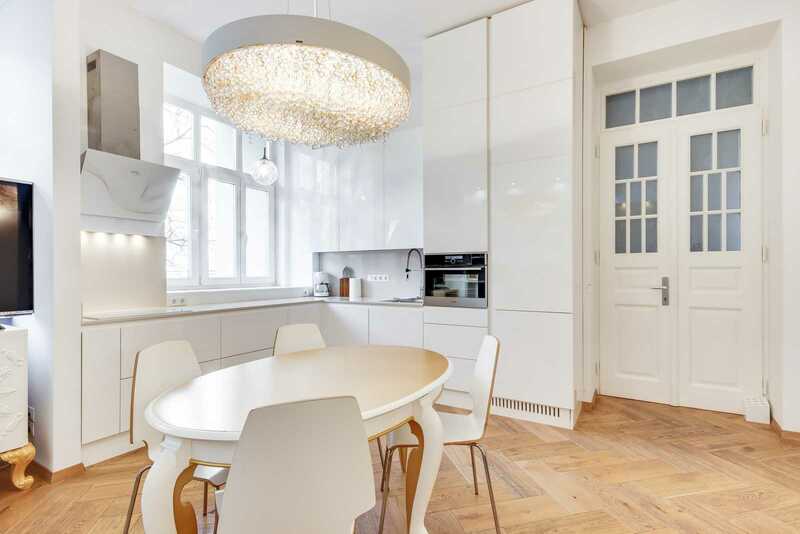 If you’d enjoy cooking in this amazing kitchen, contact us here. 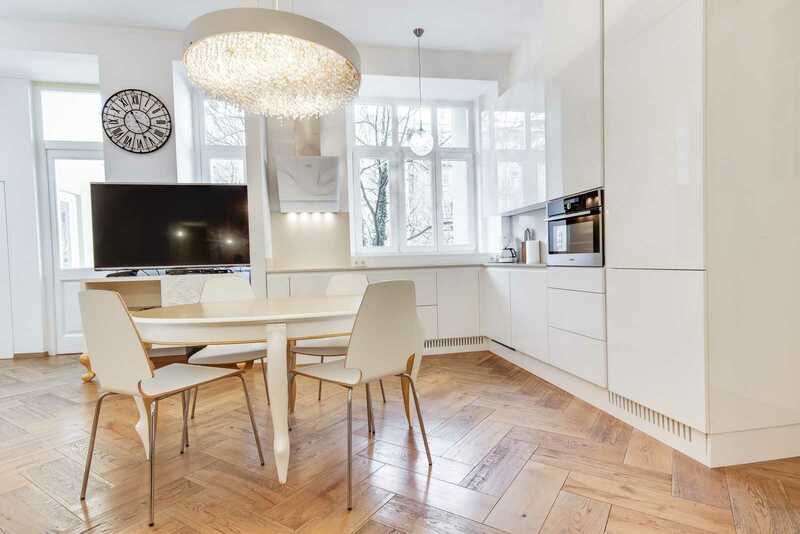 The dining area in the Ljubljana accommodation occupies just one corner of the spacious living room. It comprises a large dining table with four matching chairs and is illuminated by an attractive, overhead lighting feature. The interior hallway, visible in the above photograph, has fitted closets for extra storage space and is where the apartment’s main bathroom is located. 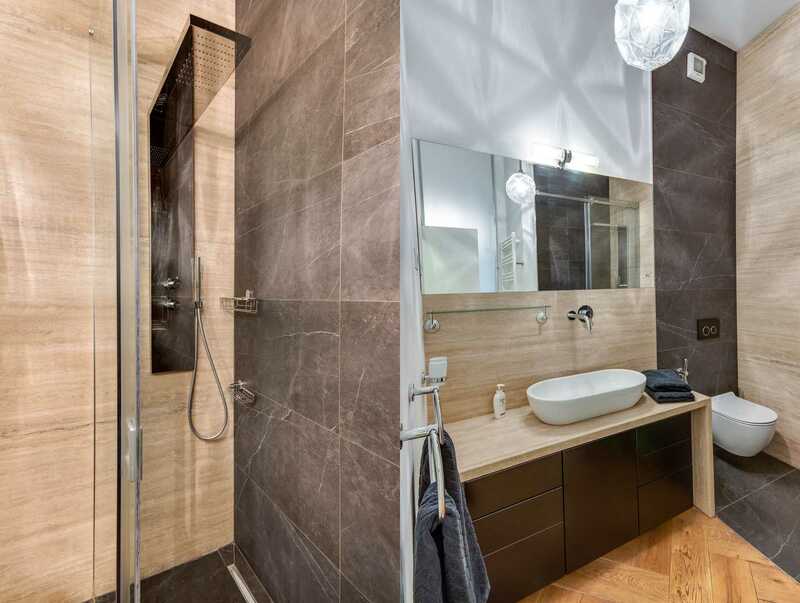 The main bathroom, located in the interior hallway, has a high quality finish and top-of-the-range fittings with a deluxe walk-in shower. 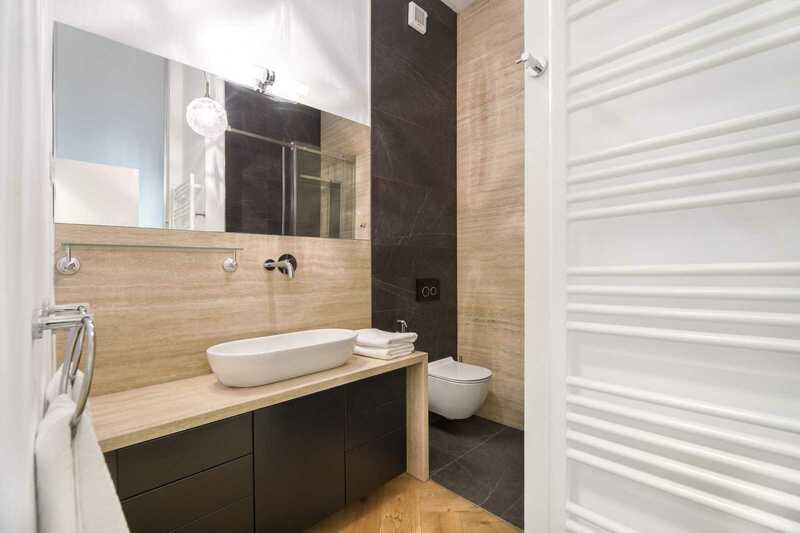 The modern sink unit provides storage for towels and cosmetics. 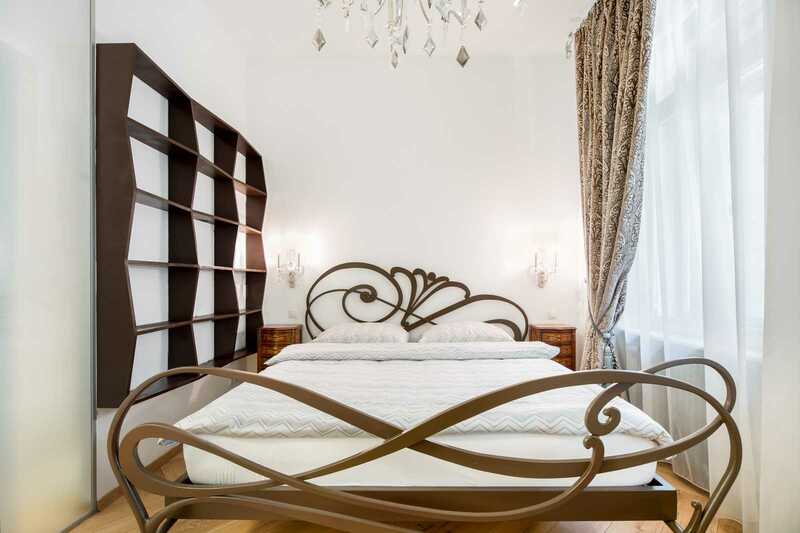 A delightful touch of Art Deco design adds a unique touch to the Ljubljana Old Town accommodation’s master bedroom. The well-chosen curtain fabric makes a great feature of the room’s large window and offers luminosity while ensuring privacy. A writing desk with office-style chair provides a comfortable work space if required. The master bedroom has a superb en suite bathroom, bright, spacious and with a walk-in shower big enough for two for those romantic moments. Has the en suite in the master bedroom given you some vacation ideas? Contact us here. 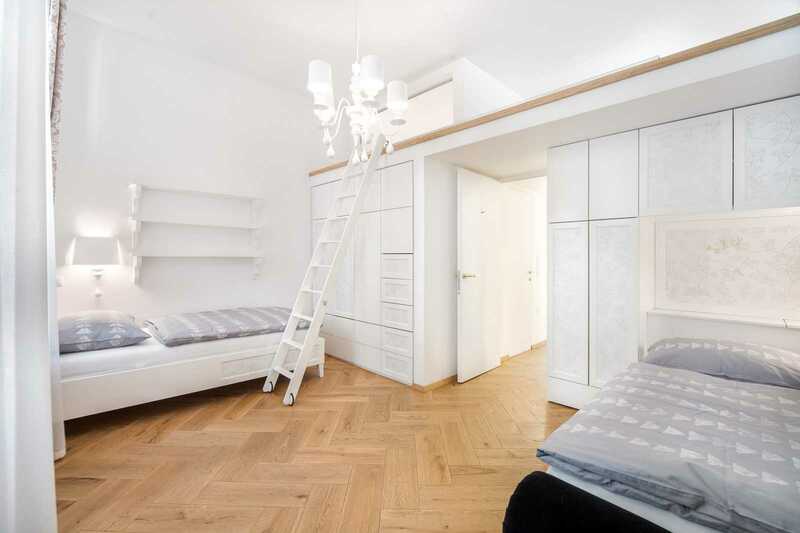 The well-planned second bedroom of the Ljubljana Old Town apartment accommodates two. 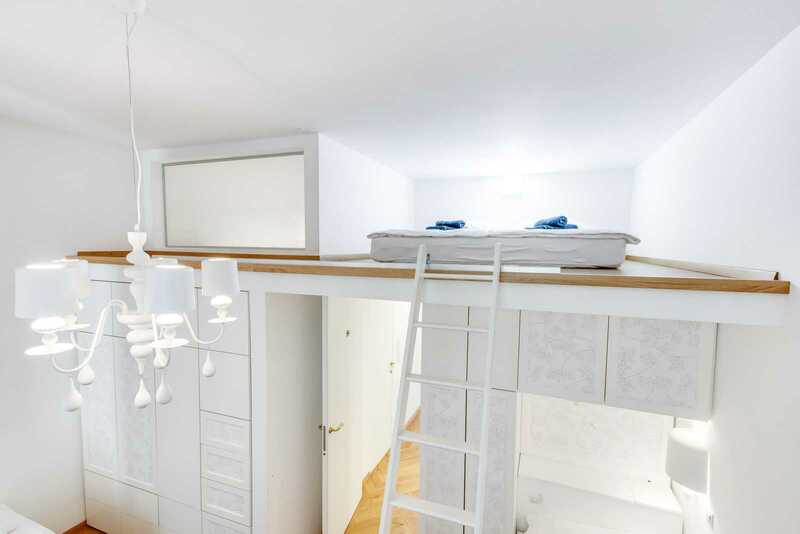 Two single beds plus a gallery spot makes it an ideal room for children or young people. Fitted wardrobes with added drawers provide more than enough space to store clothes for even the most fashion obsessed youngsters. 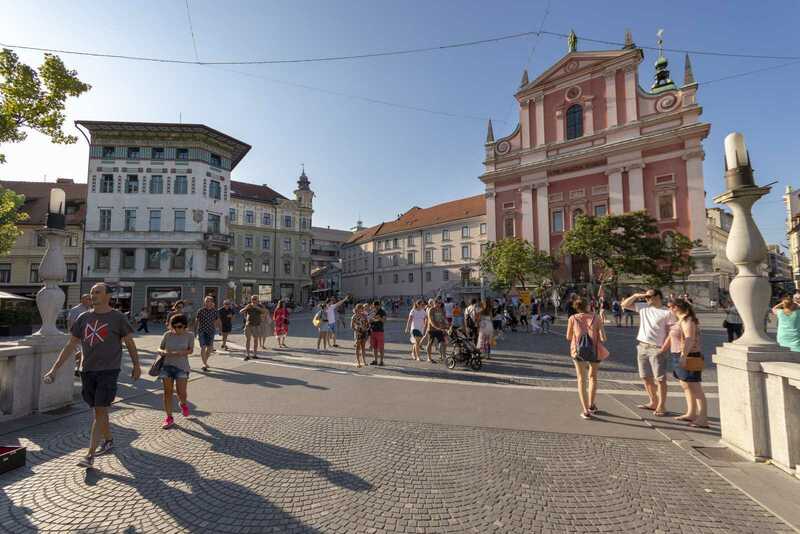 If you think your family would love staying in Ljubljana – get in touch! If you prefer staying somewhere which has both history and ambience, you’ll love being in Ljubljana Old Town. 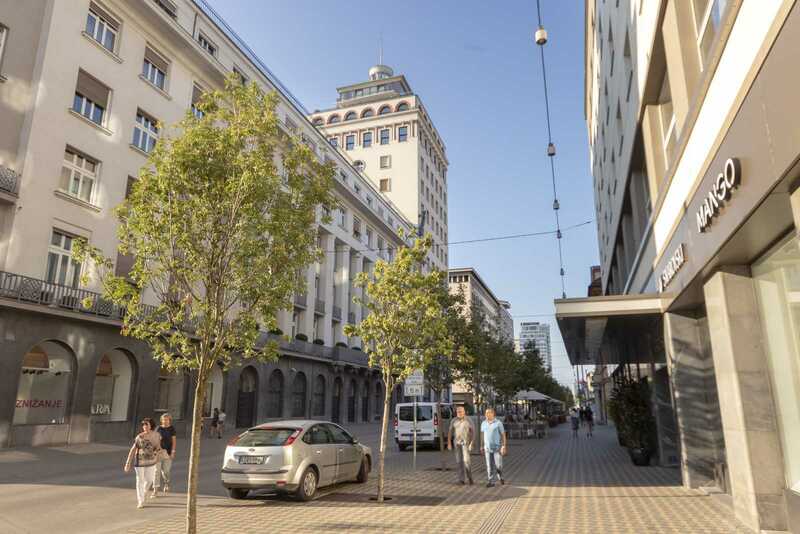 Traffic-free, you can wander around the pedestrianized streets to soak up the cosmopolitan atmosphere and enjoy coffee or drinks outside, weather permitting, in one of the many cafe and restaurant terraces. 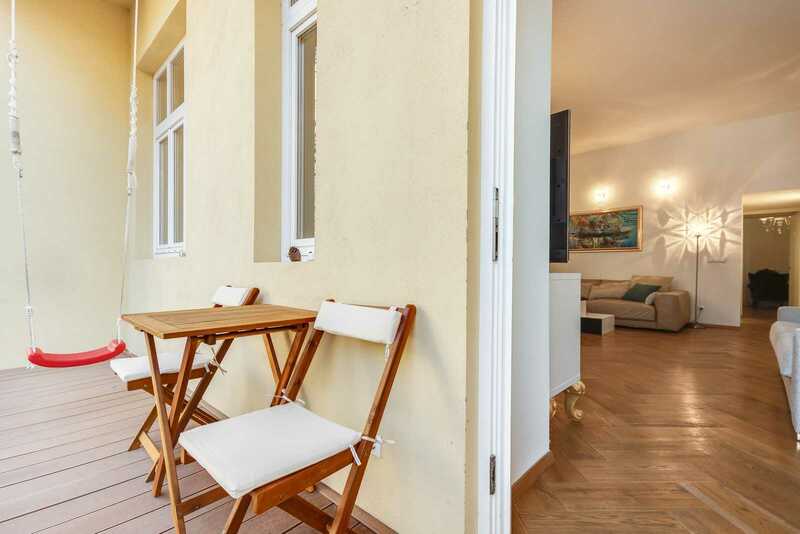 When you stay at the Ljubljana Old Town apartment, you’ll be within easy reach of some of the great places to visit in the city like Tivoli Park, the National and Modern Art Galleries and the Ljubljana Skyscraper from where you get amazing panoramic views over the rooftops. 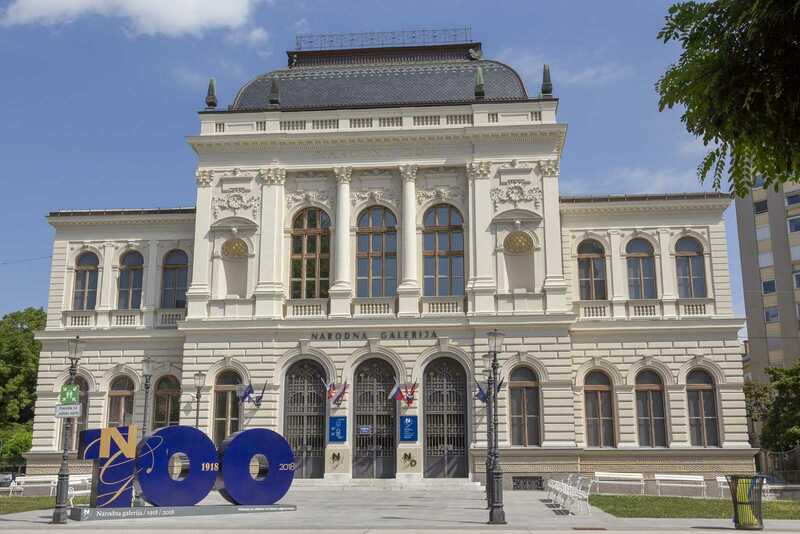 You could stroll around Congress Square to see the unusual facades of the buildings there or pop in to Ljubljana Cathedral which has some incredible painted ceilings. 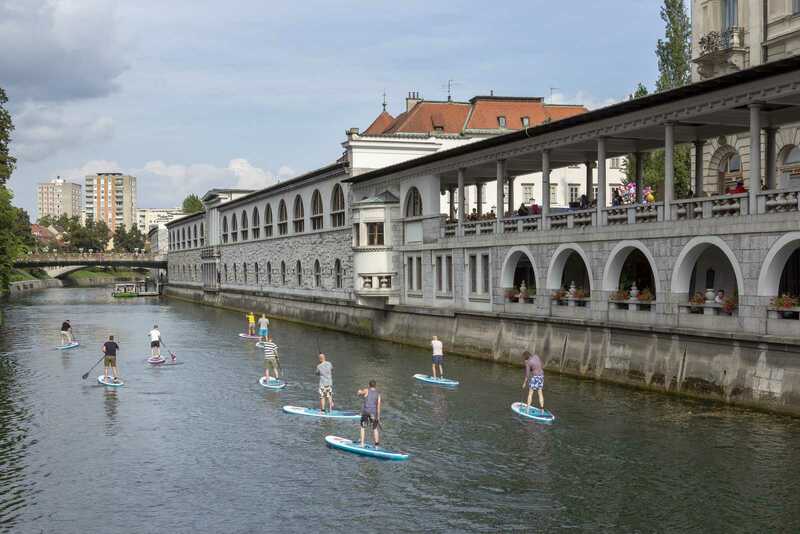 In Ljubljana, you’ll find plenty to occupy your time. 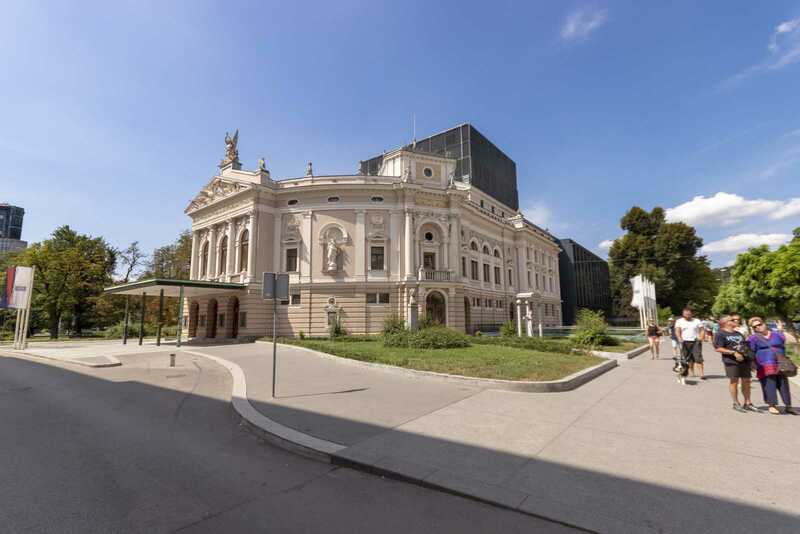 You’ll love the kitchen in the Ljubljana Old Town accommodation, but if you’re tempted to eat out, you’ll find some great Mexican food at Joe Penas, tasty Thai at DaBuDa or fantastic seafood at the Operna klet. That’s just mentioning a few! There are many more besides those, so make sure you come to Ljubljana for long enough. Prices are for 2 persons per night. For additional adult please add €30 per night, for a child between 4 and 12 years €15 per night. Children under 4 stay free of charge. City tax is not included in the prices. 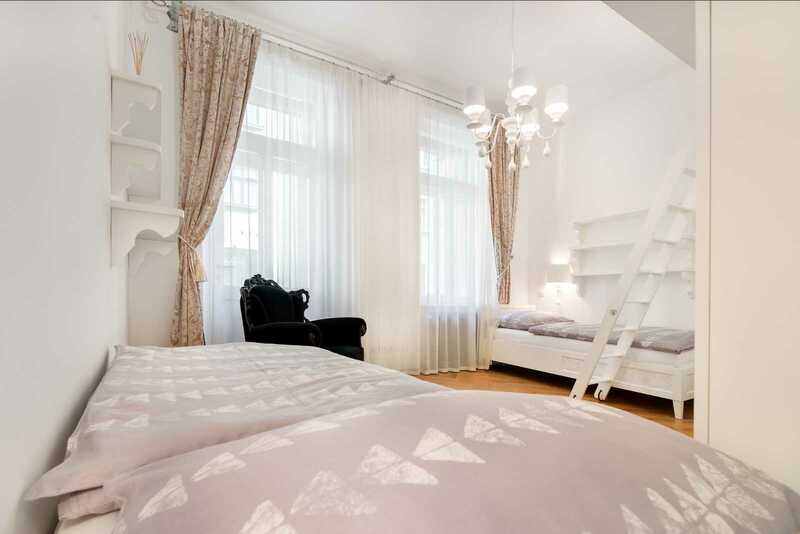 Minimum stay for Beethovnova Apartment Ljubljana is 3 nights. A shorter stay is possible at a surcharge. If you want to book 2-bedroom Beethovnova apartment or need additional information, please send us a note. We will reply without delay. You can also call or text us at +386 51 666 400 and we will check availability on the spot, take your reservation or help you with any information you might need. 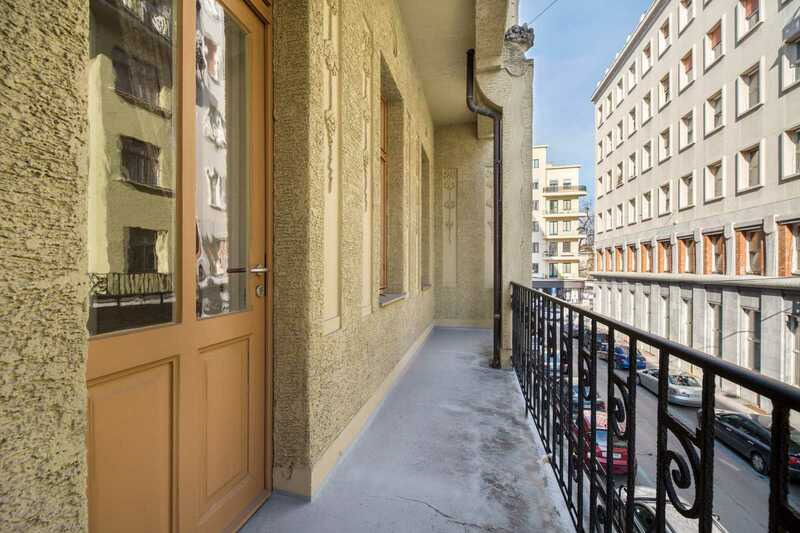 If Beethovnova apartment in Ljubljana is not available, we will do our best to find and recommend to you a comparable apartment in Ljubljana city center. 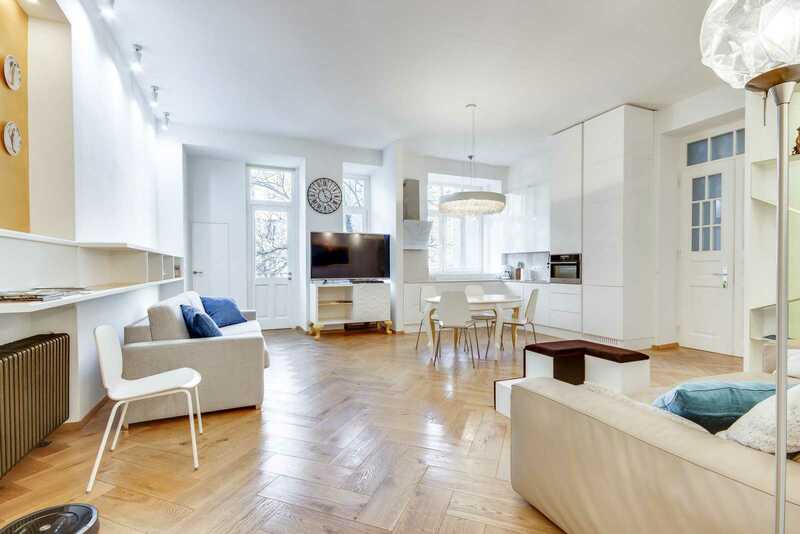 Brilliantly located, spotlessly clean, spacious, very quiet. The mattress was very comfortable. I give this apartment an A+ in every regard. It’s even pet-friendly! 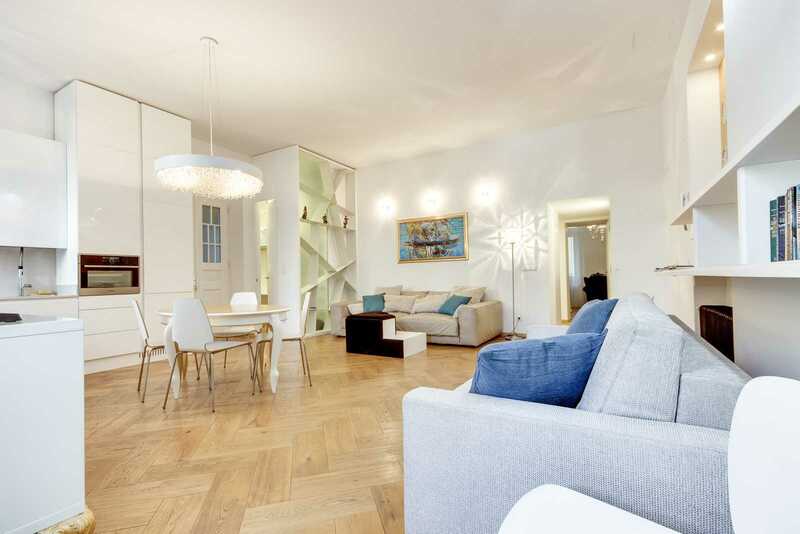 A fabulous apartment with lots of space. It’s in a great location, clean and beautifully decorated. I can’t wait to come back. The apartment is absolutely wonderful. It’s large, very well appointed and in a great location. Just perfect. Thank you! 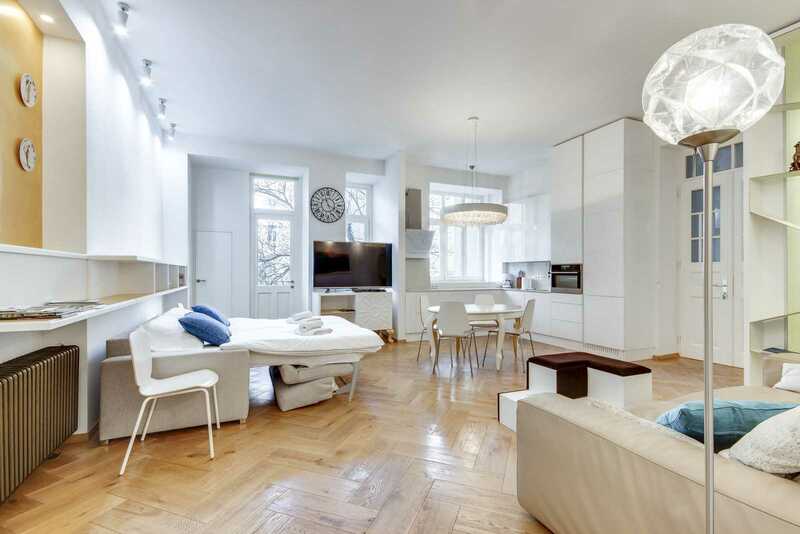 The apartment is in a perfect location and simply gorgeous. It’s everything you could need. 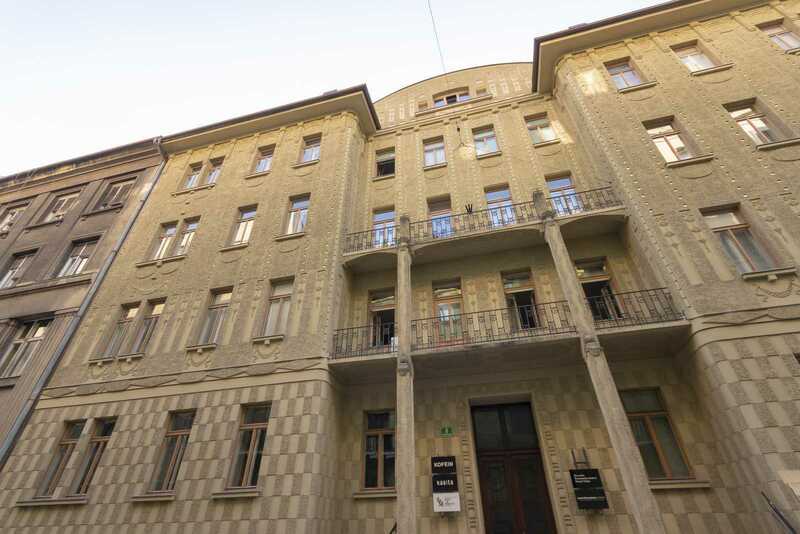 A large and modern apartment in an old building. It’s very comfortable and we were also allowed to stay a little longer because of some personal logistical problems. The staff are all friendly and very helpful. 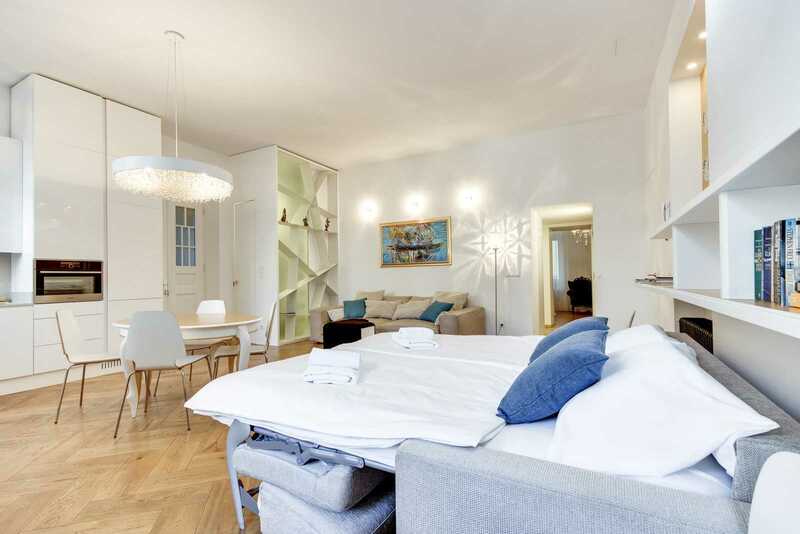 The apartment is beautiful, stylish, spacious and has everything you need. There are tons of restaurants within walking distance. A great and spacious apartment, brand new. 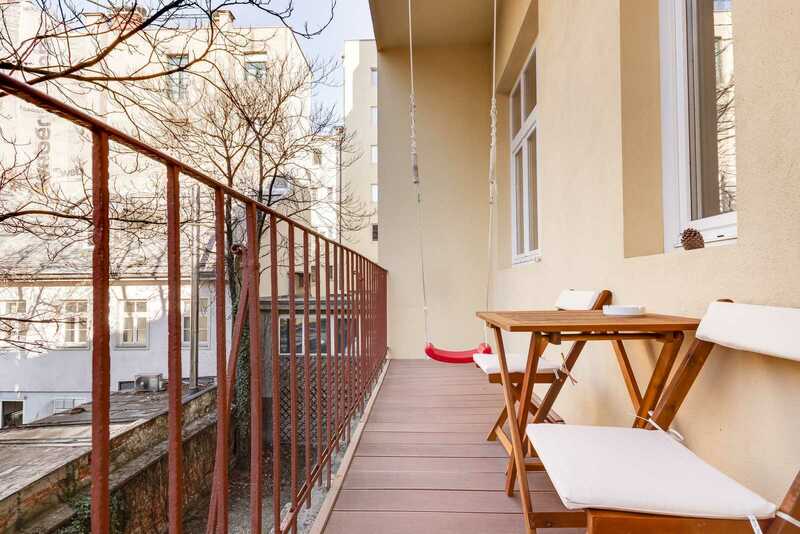 It’s exceptionally located, close to the city center but still quiet. The kitchen is very well equipped, too! 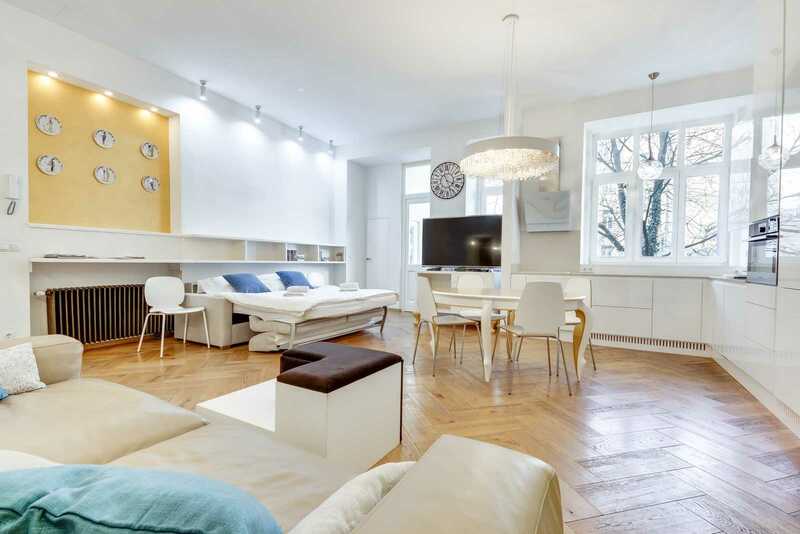 I stayed in this spacious, clean apartment with my colleague for a few days while attending a conference in Ljubljana. We would recommend this to friends, or families, also. 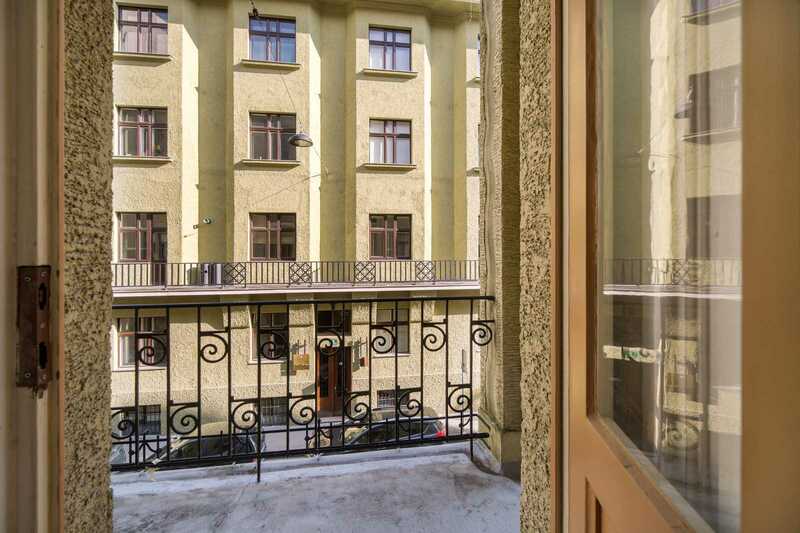 Check out this fine FLA apartment: Two Bedroom Ljubljana Apartment Beethovnova – Apartments for Rent in Ljubljana.